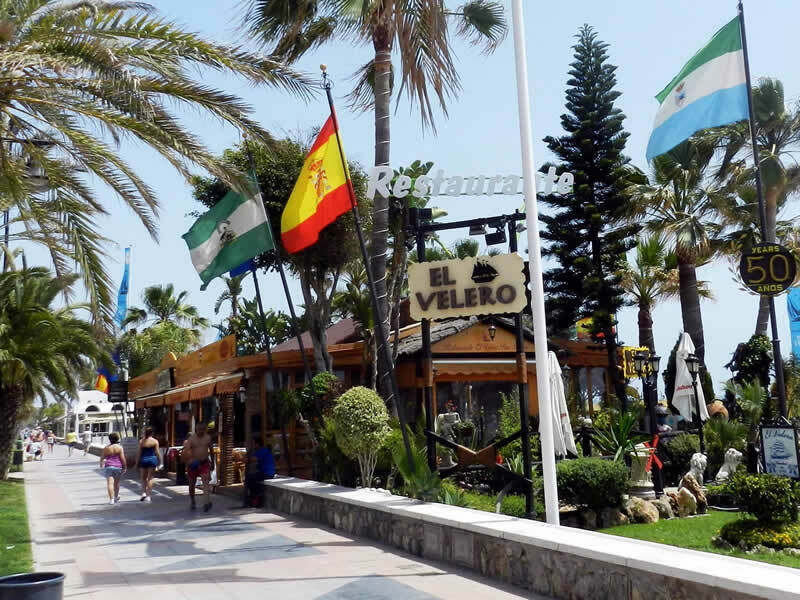 At the heart of the promenade “El Bajondillo” and located by the sea on the sand of the beach, we can find a beach bar senior under the trade name of “El Velero”. This property is part of the history of this area for its history and prestige to the length and breadth of the Costa del Sol, not in vain endorse him 50 years in the service of authentic Mediterranean cuisine. They opened in 1965, a full commitment to the future of José Luis Martínez Salmerón. Today the leadership of the El Velero, the lead José Luis and Juan Carlos Martinez and Juan Jose Jimenez, young entrepreneurs who have managed not only to maintain a good line of work where quality and service are above all other considerations. Today, the Bar-beach “El Velero” is considered a landmark, known and recognized within the world of catering and of course within the hospitality sector. It is the result of a job well done and the incorporation of new ideas commensurate with the times and the demands of a more select customer type, eager to light, sun and sea on this coast. The image offered by the Bar-Beach El Velero (always under renovation) forces us to highlight the decoration, both internal and external. We highlight the magnificent dining room that presents a hemispherical dome made up of handcrafted hardwoods work supported by columns decorated with tiny mosaics all create a relaxed, comfortable and inviting taste different from its extensive menu. Outside is worth seeing and enjoy a small oasis with a profusion of palm trees, flowers and tropical plants, ie everything a tropical garden, a dream on the sand of the beach with four splendid art with its own lighting sources that enhance more, if possible, the environment that offers all the cool marine breeze that will make us more pleasant to enjoy good food. “El Velero” offers excellent drinks from its extensive wine cellar, typical of tapas bars in the area and, when the forces are missing and needs to be reset and comfort the spirit (in this case the stomach), some fresh fish or meat warranty, always foot bar or dining, and fast efficient service, good prices and always guaranteed quality and service. Bar-Playa “El Velero” your place of meeting and meeting of the lovers of good and delicious.